Here’s what you need to know about your website - Coach & Grow R.I.C.H. Well, my good friend, Christina Hills has just released a very cool download that will help you save both time and money when it comes to building your website or improving the one you already have. 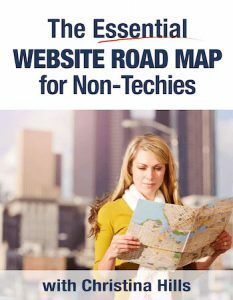 It’s called “The Essential Website Road Map for Non-Techies: Paving the Way to a Hassle Free, Professional Website” and I highly recommend you download and compare it to what you’re currently using as your online presence. Download the Essential Website Road Map for Non-Techies here. She’s been teaching non-techie entrepreneurs how to build effective websites for nearly 10 years. She definitely knows her stuff! And she’s only offering this as a free resource for a couple of weeks.